The Load Cell 220 bending ring rang of load cells is available in capacities from 5000 kg to 50000 kg. 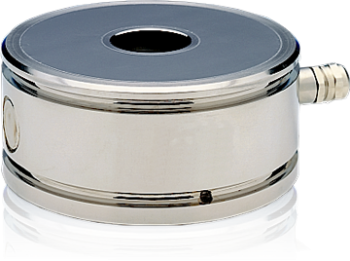 This high quality stainless steel load cell has a very low deflection and a high resonant frequency allowing high resolution measurements. The very compact design is hermetically sealed to IP68 by welding. This combined with its approval to OIML R60 6000D means that this load cell can give extremely accurate reproducible results, over a long term even in harsh industrial environments. Large tanks of up to 400t can be mounted on up to 8 or 10 points. Due to its low height, the addition of 220 based weighing system can be achieved without major reconstruction work. Among the accessories specially developed for this load cell series include a range of shock mounts and Cell-mates.